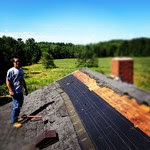 The sun was shining, the air was clear and a nice, soft breeze was blowing across the meadow...a perfect day to start tearing the shingles off the roof! Michael and young Michael finished up another project they were working on and headed to the cottage around noon yesterday to start the roof job. When they arrived, however, a large branch from the old oak tree was blocking the driveway. Upon inspecting the massive oak that sits close to the road, the men discovered a large portion of the oak's side had peeled away from the tremendous weight of it's branches. We knew this was going to happen at some point but we were hoping we could put it off for just a little longer. We're actually glad it happened now because it would have been awful if someone was underneath it when it fell. We think that the first big branch that we cut a few weeks ago, was supporting this branch and it just couldn't hold up the weight anymore. It's a grand old tree, at least fifteen feet around (even though it doesn't look that big in the photos). Michael's nephew Matt, who is a licensed Arborist, came to check it out and told us the tree was well over 200 years old. We don't want to lose the tree so we are going to have him trim and prune as much as he can to save it and make it safe. There will be at least three years of firewood from what is trimmed...that will pay for the tree work! I think that's a pretty good deal don't you? 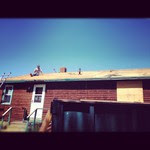 After the tree episode, ladders were positioned and the dumpster was ready to be filled with old roof shingles. Because it's such a small roof, it didn't take long for the east side of the house to be completely stripped and watershield applied. These photos were taken with Michael's phone so the quality isn't that great... but you get the idea.